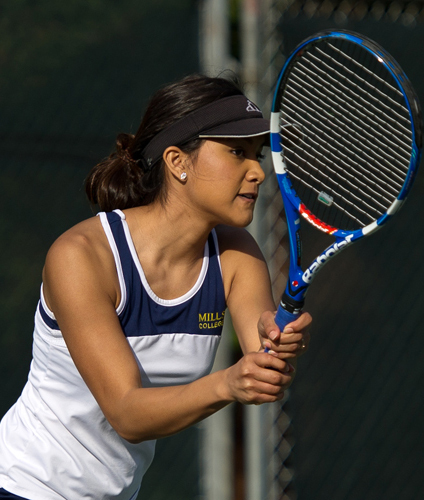 Corrin Geibig, a sophomore Pre-Nursing major from Tracy, CA, is in her second year on the Mills tennis team and has turned up the intensity on the courts this past week. Bringing a focused attitude to practices and matches, she is a team leader by example. Corrin had a breakthrough, decisive win (6-3, 6-1) against the University of Puget Sound’s #1 player during the tennis team’s trip to Tacoma, WA on Saturday, Feb. 26. She followed that win with close, aggressive doubles and singles matches against Pacific Lutheran University on Sunday, Feb. 27.